West Hythe is a hamlet near Palmarsh in Kent, England, and a few miles west of the cinque port town of Hythe . Modern settlement is mostly on the plain south of the Royal Military Canal, and immediately north and north-west of Palmarsh, but the ancient parish church (in ruins) stands at the foot of the escarpment north of the canal, where much of the ancient village was located. Modern development to the west of Hythe (mostly housing, together with some local shops) in a corridor along the A259 coastal road, has led to the joining together of the ancient town of Hythe and the rural hamlet of Palmarsh in a single urban conurbation, which itself reaches almost to the West Hythe community. The ancient parish church, dedicated to St Mary, is disused and in ruins. Nonetheless, it is listed as a Grade II monument, and is a structure monitored by English Heritage. It was constructed in the twelfth century and heavily rebuilt in the fourteenth century. The British Listed Buildings website reports that the church was burnt down in 1620. There is some evidence that St Mary's may have been, in origin, a minster church. Botolph's Bridge is a small hamlet, consisting of a few family homes and a public house named "The Botolph's Bridge". 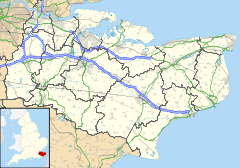 The hamlet is associated with West Hythe, with which it shares community activity and history. Its name is derived from the Saxon monk and evangelist Botwulf of Thorney. His connection with the community is unclear, and the name may be derived from Botwulf's patronage of farming. It is also possible that the saint visited the area during one of his known preaching trips from his native East Anglia to the South Saxon people. According to local legend, the name is derived from the time of the Danish invasions of eastern England, when Botolph's body was exhumed and carried to safety (at an unknown location) by monks of Ikenhoe. The legend reports that the body was brought to West Hythe and there guided by a mysterious light from above to the only safe crossing of a deep drainage dyke, at the place now known as Botolph's Bridge. The legend is represented artistically on the pub sign of the Botolph's Bridge Inn. ^ West Hythe at Vision of Britain. ^ See BLB reference here. ^ See "St Mary, West Hythe, and St Clement, Old Romney: The Chip-Chevron sculpture and its architectural context", by Daniel Secker, 2011, pages 2-4, available on-line at Medieval Site. ^ See an account of the legend on the website of the Botolph's Bridge Inn. This page was last edited on 3 April 2018, at 04:20 (UTC).